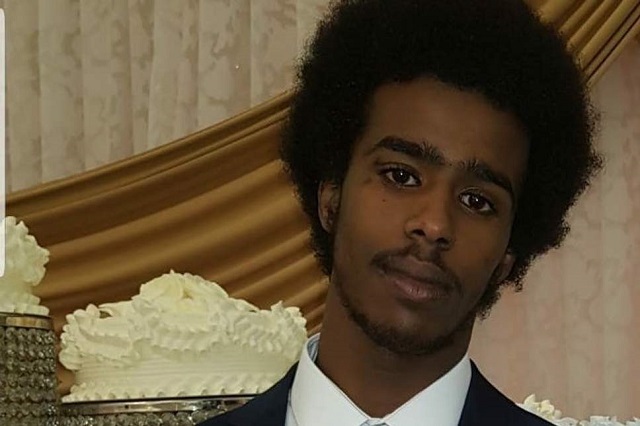 On 27th August of this year, Abdi Ali was found murdered, his body hidden in a loft a few miles from where he lived, in Enfield. He had been missing for 8 months. Abdi had vanished from his family home hours after his sister’s wedding, on December 11 of last year. He was a former pupil at the Oasis Academy in Enfield, and had moved to London from Somalia with his seven siblings ten years ago. Seeing Abdi’s photo, taken on the day of his sister’s wedding and (as I later found out from his cousin Anisa) discovering this was the last photo ever taken of him, probably the same day he was murdered, crushed me. On the 25th September, I spoke at Brixton library about Abdi. I linked his murder to the disproportionate number of black kids and teenagers who go missing in Enfield, London and the UK. I spoke about the key role of poverty, county lines and drug trafficking, and the police and government responses. Having met with his cousin and found that Abdi never really left Enfield other than to go on holiday with his family to Somalia. He was far from the roadman that some may have you believe. Halfway through my talk I wondered out loud: if my nephews — aged between 14 and 25 — had gone missing would anyone have cared? Would articles have been written, a hashtag on Twitter, protests? In a month’s time, on Nov 23, Gary Hopkins, 36 and Stacey Docharty, 28 will appear at the Old Bailey on Nov 23 on charges of murder, perverting the course of justice and preventing the lawful burial of Abdi Ali so let’s see what happens. I have tried my best, however little, to support his family in any way I could. This will of course never make up for what they, and his girlfriend, have lost. I am glad there is more awareness about Abdi Ali and his short life and death now, but I kind of think it’s all of our duty to do at least something if we are to call ourselves activists or even just human beings. 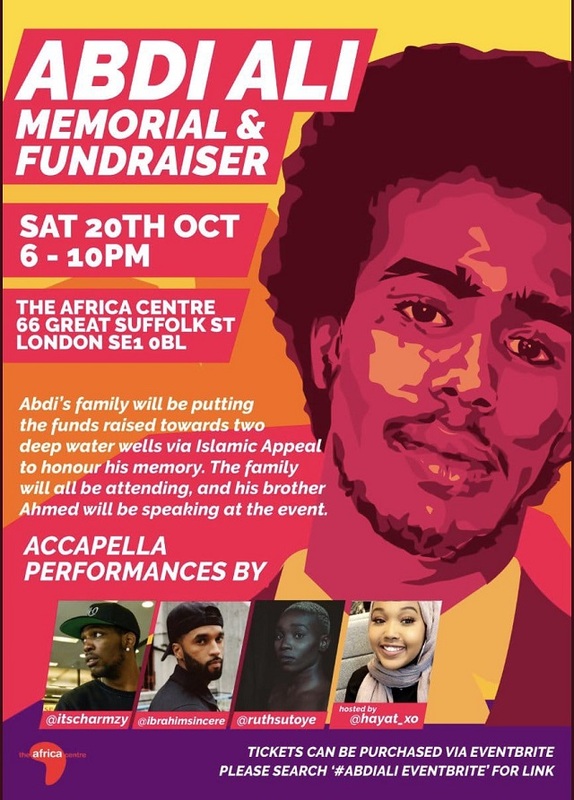 Tomorrow, Saturday 20th October, the memorial fundraiser for Abdi will be held. The event will be hosted by Hayat, Vice President of of the University of Roehampton’s Somali Society. Abdi’s good friend Charmzy, also from Enfield, will be performing a-capella alongside artist and poet Ruth Sotoye, musician and poet Ibrahim Sincere, and Somali poet Neimo Askar. Abdi’s family will be putting the funds toward two deep water wells via Islamic Appeal to honour his memory. In their culture, if there is a well in the name of a deceased person, everyone who donates or drinks from the well benefits, as does the deceased. Please come along and celebrate this young man’s life. I look forward to seeing you there. If you wish to donate but are unable to attend please still go ahead via the donate/tickets button. 100% of the funds go to Abdi’s family to purchase the wells in his name. The event will be held at the Africa Centre who have donated their venue.